Everyone is most welcome to post in this thread ... conversation can be anything you choose ... Yankee-related or just about day-to-day goings on. I just ask that we please have no political discussion, as it only leads to arguments. Come around often, and enjoy! Hehe, never too early eh? Gotta make sure I reach our goal! Mo, I want to thank you and so many others here for making this season even more enjoyable for me. The Yankees gave us an exciting run, that unfortunately fell shy. Give credit to the Tigers, they earned the victory. Too often fans forget there are 2 teams in these games. To Joe G, the team and the front office, THANK YOU for 2011. God Bless you all this off season and may He allow ALL of us to be back posting throughout this new season. P.S. has the 2011 post been deleted?? Did it ever really exist? Did I dream it? Good move It's time to turn the page the 2011 AL season is over. The lack of timely hitting last night cost us the chance to move on in the 2011 AL post season. It's time to look forward to the 2012 AL season. The Yankees Question will be once again pitching. The New York Yankees ownershipe needs to get the GM Cashman situation done ASAP, so the team has effective front office leadership for the off season baseball business that needs to be done. After that the organizational meetings will take place and off season personnel moves can be planned and made without unnesscary delays. Well said ... and thank you gracing this thread with joy and enlightenment. October 7, 1961- At Crosley Field in Cincinnati, New York Yankees RF Roger Maris wins Game 3 of the 1961 World Series with a 9th-inning HR off of Cincinnati Reds P Bob Purkey. 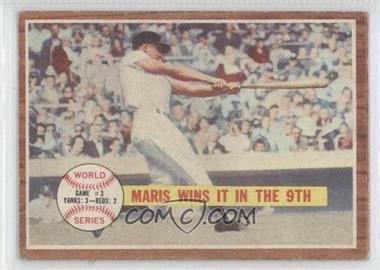 It is Roger Maris first HR since hitting HR #61 on October 1st at Yankee Stadium. The Yankees win the game by a score of 3-2, as closer Louis Arroyo picks up the victory for the Yankees in relief. Johnny Blanchard hit a pinch-hit HR in the 8th inning for the Yankees to tie the game at 2-2. The best thing in life is to always look forward! Here's to the World Champion Yankees of 2012! and thank you for finding our new home. If we are diligent and post those messages that may be a little off topic here, we can reach the goal of 2012. Philippians 4:13 - "I can do all things through Christ, who gives me strength." To be honest, in the beginning of the season, I did think we'd win the WS. I though it was an outside shot of making the playoffs this season, and although I was bummed about being knocked out of the playoffs, this team exceeded my realistic expectations for 2011. I always figured that 2012 was "the year". With Nova having a full year under his belt, Cano just entering his prime, Granderson seeming to find his HR stroke and ability to hit lefties, and Montero ready for a full season in the Bronx; hopefully 2012 will be "the year" as I want Mo to go out on top. I dont wanna say he definately wont, but I dont see Mo going on past 2012. Mo has 5 championships, the all time saves record (though he could probably care less), will be entering his 17th full season, and has kids who hate seeing their be gone for half of the year. Also, it seems that the Yankees may have found their next closer in Robertson. As I said, I dont wanna say he definately wont, but I dont see Mo continuing past 2012. So hopefully he can go out on top in 2012.